ETEM has successfully exhibited its system solutions at the BAU International Fair which took place from 14th to 19th January in Munich, Germany. Located on an area of 72 sq. m. the stand of ETEM presented specific solutions and products that comply with current architectural trends. 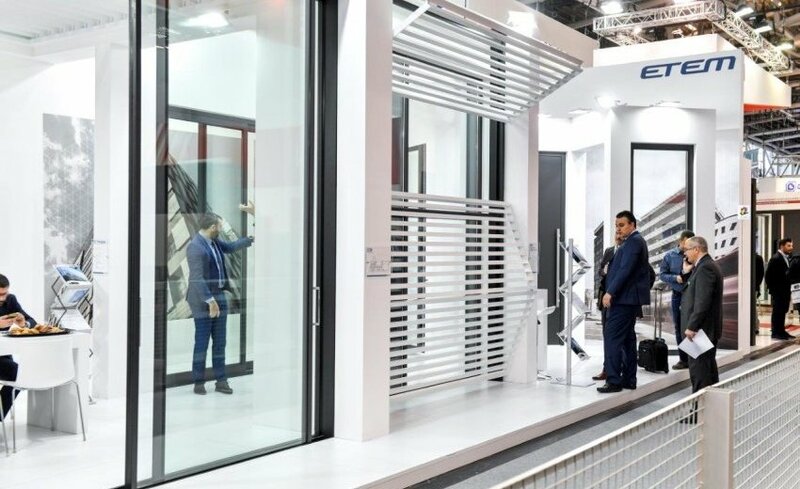 The team of ETEM demonstrated to the visitors part of its latest system solutions – retractable sun shading systems with automatic control in combination with curtain wall E85, door and window system E68 with hidden vent, flush panel entrance door E75 specially designed pergolas and other. The greatest interest among visitors to the stand attracted the sun shading special solution system with the possibility of remote control via a mobile phone. According to the organisers this year, BAU 2019 has made several record-breaking achievements. For the first time on a huge exhibition area of 200,000 square meters, 2250 companies from 45 countries have presented their products and solutions for the construction sector. The number of visitors this year reached 250,000 and the number of foreign guests outside Germany reached a new maximum of 85,000. The opening of a new trade show for digital solutions in the construction sector was announced at the forum – digitalBAU. The organiser of the digital event will be Messe München in partnership with the Federal Association of the building software (Bundesverband Bausoftware – BVBS). DigitalBAU is expected to be held for the first time in Cologne from February 11 to February 13, 2020. We would like to take this opportunity to thank all for visiting our stand at BAU 2019.